The Russian Progress M-54 cargo freighter undocks from the International Space Station's Zvezda service module aft port on March 3, as viewed by onboard and ISS cameras. Known in the station's assembly sequence as Progress 19P, the craft was launched last September with food, water, equipment and fuel. It was filled with trash before the undocking to burn up in the atmosphere. Mike Suffredini, NASA's program manager for the International Space Station, updates reporters on the technical aspects of implimenting the revised assembly sequence and configuration for the orbiting outpost in this teleconference held March 3. Leaders from the U.S., Russian, European, Japanese and Canadian space agencies hold this press conference at Kennedy Space Center on March 2 following meetings to approve a revised assembly sequence for the International Space Station using 16 space shuttle flights. Brown dwarfs -- failed stars that fall somewhere between the smallest stars and the largest planets on the spectrum of heavenly objects -- have always been viewed by astronomers as a critical link in the understanding of how both stars and planets form. The trouble with brown dwarfs, however, is that they are hard to find and, so far, they have defied nearly all attempts to accurately assess their size. But now astronomers, including a University of Wisconsin-Madison astronomer, report the discovery of a pair of young brown dwarfs in mutual orbit, a discovery that has enabled scientists to weigh and measure the radius of brown dwarfs for the first time. The discovery of the paired brown dwarfs and critical measurements of the unsuccessful stars are reported in the March 16 issue of Nature, a leading scientific journal, by a team of astronomers from Vanderbilt University, UW-Madison and the Space Telescope Science Institute. "To really know for sure if something is a brown dwarf, you have to measure its mass," says Robert Mathieu, a UW-Madison professor of astronomy and an author of the new Nature report. "This was our first opportunity to do so with precision for young brown dwarfs." The new work is important because it is the first direct measurement of the radii and masses of stars that have failed to achieve nuclear fusion, the fiery process at the heart of more conventional stars like the sun. The discovery was made by Mathieu, Keivan G. Stassun of Vanderbilt, and Jeff A. Valenti of the Space Telescope Science Institute. The group drew on a mass of observations first made over ten nights 12 years ago by Mathieu and Stassun. They used relatively small telescopes at the National Science Foundation's (NSF) Kitt Peak National Observatory near Tucson, Ariz., and the U.S. Naval Observatory near Flagstaff, Ariz.
Over the next 12 years, the group accumulated an additional 1,600 measurements obtained over 300 nights of observing at Kitt Peak and the Cerro Tololo Inter-American Observatory, a major observatory operated by NSF in Chile, and at the international Gemini South observatory in Chile. The brown dwarfs found by the group, according to Mathieu, are young, a mere 1 million years old. They reside just 1,500 light years from Earth in the Orion Nebula, a rich star-forming region of space. "Our goal was to look for eclipsing binaries," says Mathieu of the observing program that scoured the well-known and much-studied stellar nursery. "We were looking for stars that blinked. That is the mark of an eclipsing binary (star system)." Binary star systems -- when two stars are in mutual orbit -- are helpful to astronomers when they can be viewed edge-on and one star eclipses the other as they perform their celestial waltz. It is that eclipsing phenomenon that enabled the critical measurements of the stars' physical properties, says Stassun, the Vanderbilt University professor who gathered the observations that underpin the new discovery while a graduate student with Mathieu at Wisconsin. The brown dwarfs are about the size that astronomers predicted, given their youth. The bigger of the two is 50 times the size of Jupiter, the largest planet in our solar system. The smaller is about 30 times the size of Jupiter. Despite their large size -- 70 percent and 50 percent of the radius of the sun, respectively -- the brown dwarfs weigh in at only 5.5 percent and 3.5 percent of the mass of our sun. Such measurements provide a "Rosetta Stone" for translating the physical properties of other brown dwarfs, even those not in a binary system, according to Stassun. Astronomers have long speculated about the physical attributes of brown dwarfs, but until now no one has been able to make a full set of direct measurements. In most respects, the new observations conform to established theoretical models for brown dwarfs, but, surprisingly, the less massive of the two dwarfs is hotter than its heftier companion. "When we look at stars, any stars, the more massive ones are always hotter," says Stassun. "What may be the case, and this is speculation, is that the smaller brown dwarf had its structure altered by some physical process not included in any of the current theoretical models, a strong magnetic field, perhaps." 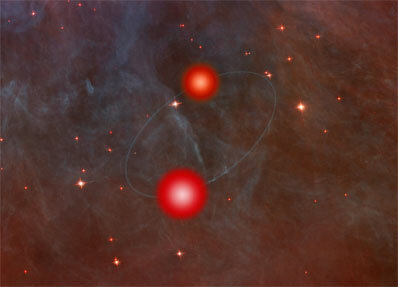 An alternative explanation, Stassun says, is that the paired brown dwarfs are "not birth twins, but are adoptive twins." In other words, they did not form together in the same coalescing mass of gas and dust, as most binary star systems do, but formed at different times and places, and somehow became companions locked in mutual orbit. Theory holds that brown dwarfs begin life much as ordinary stars do, forming from clouds of interstellar dust and gas. However, the nuclear processes that drive conventional stars are never ignited as the pressure and temperature at the center of the star are not great enough -- because of the star's low mass -- to get the jump-start they need. "The defining characteristic of a brown dwarf is the mass is low enough that the central temperature never gets high enough to ignite hydrogen fusion," Mathieu explains. However, brown dwarfs do glow, says Stassun, because of the powerful gravitational forces at play as the star contracts with age. The new work, says Mathieu, may also help resolve the different evolutionary pathways of stars and planets. Planets, like Jupiter, form in disks of gas that surround their parent stars, and thus have different characteristics than stars, including failed ones like brown dwarfs. "Some people think of Jupiter as a failed star, but it very likely has an iron core, while these brown dwarfs are hydrogen to their very centers," Mathieu explains. "It is the comparison of these two evolutionary paths that make brown dwarfs and exoplanets linked and an exciting comparison." Finally, the new findings will not only help astrophysicists refine theoretical models for brown dwarfs, but they also provide a rare empirical glimpse into the nature and origin of how some stars fail.